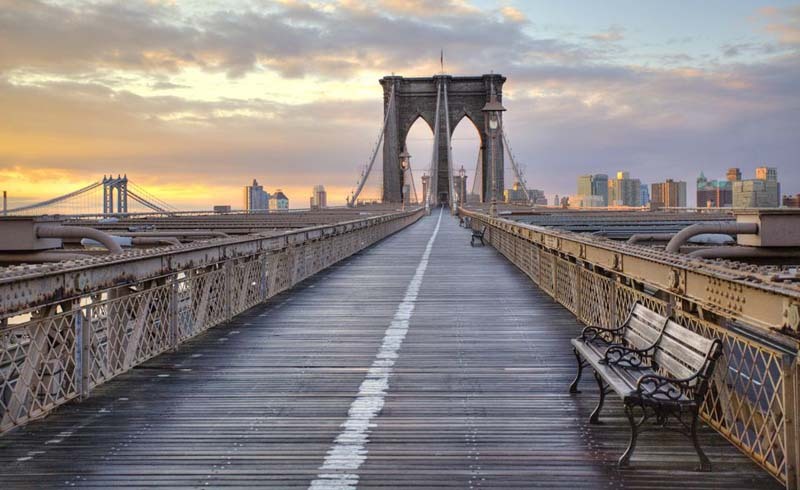 There's even a dedicated pedestrian walkway on the Brooklyn Bridge, above the roaring car traffic, so it's a wonderful stroll, but first, you need to decide which side you want to start on and how you'll get there to begin your journey. According to the New York City Department of Transportation, more than 120,000 vehicles, 4,000 pedestrians, and 3,100 cyclists cross the bridge each day. The bridge accommodates six lanes of automobile traffic, and there's no toll for vehicles crossing the Brooklyn Bridge. The wide, central pedestrian and bike pathway is shared and elevated above the traffic whizzing by just below. To avoid a potentially dangerous collision, be sure to diligently observe the designated lanes for walkers and cyclists, which are only separated by a painted line. The entire length of the bridge is just over a mile long. By foot, you'll need about 30 minutes to traverse it while going at a brisk pace, and up to an hour if you make stops for pictures and to enjoy the view (which you absolutely should). There are two entrances to the Brooklyn Bridge on the Brooklyn side, and many subways run nearby in the borough for easy access to the pedestrian walkways. The Brooklyn Bridge Pedestrian Walkway begins at the intersection of Tillary Street and Boerum Place and is the entrance one sees from a car when crossing the Brooklyn Bridge. The second way to get onto the walkway is to access it via the underpass on Washington Street, about two blocks from Front Street in Brooklyn. This underpass leads up a stairway to a ramp that leads directly to the walkway itself. You can take the A or C subway to the High Street-Brooklyn Bridge stop for the closest access to the bridge. From the station, take a right on Pearl Street then take a left on Prospect Street to the underpass entrance on Washington Street. For a more charming adventure, you can exit the 2 and 3 subways at Clark Street Station, then take a left onto the historic Henry Street, heading downhill toward the bridges. Take the pathway through the co-opt houses at Cranberry Street and cross Cadman Plaza West, then follow the path through the park to Washington Street (Cadman Plaza East), where the underpass will be on the left. You can also take another, longer but more straight-forward route from the 2, 3, 4, 5, N, or R subways from Borough Hall. From here, you'll walk along Boerum Place for about 12 minutes, passing the Brooklyn Marriott on the right before coming to the Brooklyn Bridge pedestrian path at Tillary Street. To get back to Brooklyn, you can always walk back across, but you can also take the J, Z, 4, or 5 from City Hall, or the 2 and 3 from Chambers Street. The coolest and fastest way to return, though, is on the NYC Ferry from the Fulton Ferry Landing Stop in Brooklyn Bridge Park. 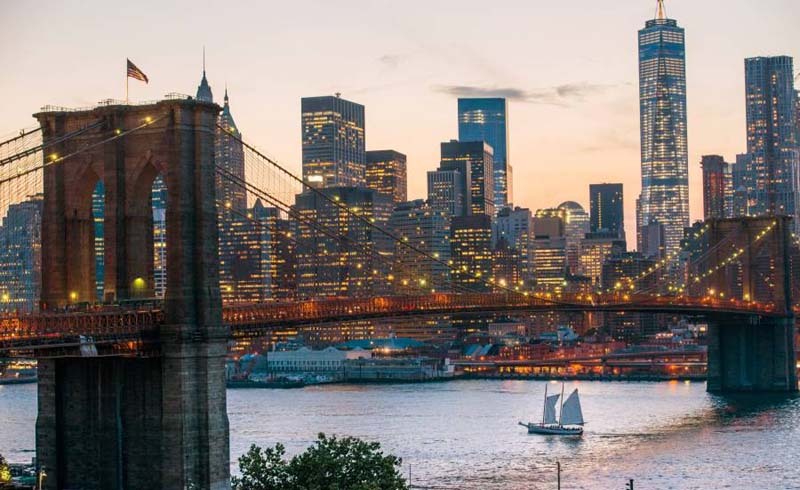 Accessing the Brooklyn Bridge Pedestrian Walk is easier from the Manhattan side, but the views aren't quite as breathtaking as coming from the other way. From Manhattan, the entrance begins just across from the northeast corner of City Hall Park along Centre Street. The closest subway stops are via the 4, 5, and 6 trains at Brooklyn Bridge–City Hall station; the J or Z train at the Chambers Street station; or the R train at City Hall. However, if you are traveling from Manhattan's west side and don't mind walking a few extra blocks, you can also take the 1, 2, or 3 trains to Chambers Street, walk east, then cross Park Row to begin your walk across the bridge. Once you arrive in Brooklyn, there are two exits, one that leads down into DUMBO, and the other into Downtown Brooklyn. To get back to Manhattan, get off via the staircase at first exit in DUMBO, which leads across Prospect Street to Washington Street, and take the nearby F train on York Street or the A and C train on High Street. Farther along on the bridge, a descending ramp continues (a better option for cyclists) to let out onto Tillary Street and Boerum Place in Downtown Brooklyn; the nearest subway lines from that exit are the A, C, and F at Jay Street-Metrotech; 4 and 5 at Borough Hall; or the R at Court Street. The bridge first opened to the public in 1883 in a dedication ceremony presided over by President Chester A. Arthur and New York Governor Grover Cleveland. Any pedestrian with a penny for the toll was welcomed to cross—an estimated 250,000 people walked across the bridge in the first 24 hours—horses with riders were charged 5 cents, and it cost 10 cents for horse and wagons. Unfortunately, tragedy unfolded just six days of the bridge's debut, when 12 people were trampled to death in the midst of a stampede, incited by a panicked (false) rumor that the bridge was collapsing into the river. The following year, P. T. Barnum, of circus fame, led 21 elephants across the bridge in an attempt to quell public fears about its stability. The pedestrian toll was repealed by 1891, along with the roadways toll in 1911, and the bridge crossing has been free to all ever since. Although there used to be subway and streetcar services over the bridge, the elevated trains ceased operations in 1944 and the streetcars followed suit in 1950.